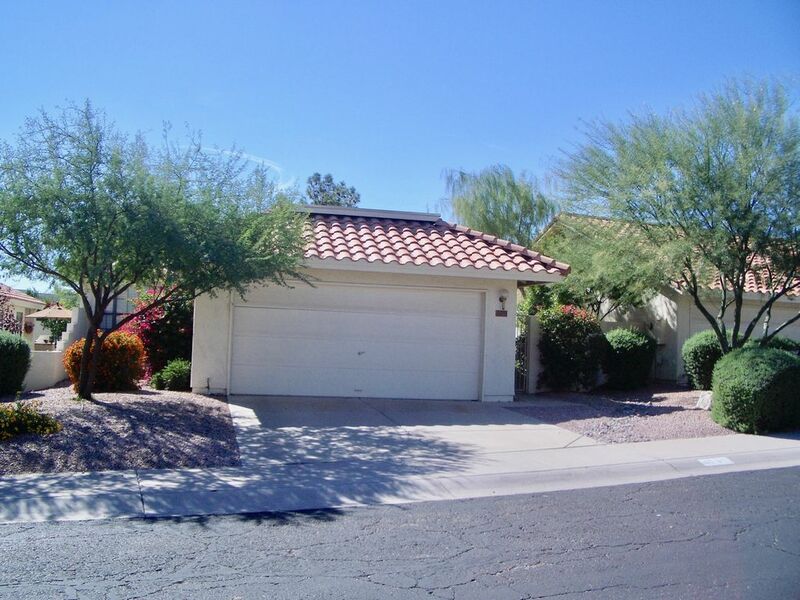 This is a one story single family home in the much sought after central Ahwatukee area. It is very close to I-10 for easy access to all that Phoenix has to offer! The bright and open floor plan has a Great Room with dining area, two bedrooms, a den, two baths, an inside laundry area and a two car garage. Upgraded features include Plantation Shutters/wood blinds and mediterranean tile throughout. Just off the dining area is a covered patio with a charming, private garden with flowers and cactus. This is an adult (one person must be 55+) community with a swimming pool and spa just a block away. Membership provided in the Ahwatukee Recreation Center for many additional activities. Located just a few blocks from a public golf course, this home is ideally located to many area attractions. Shopping for grocery and drug stores, cleaners, movie theatre, book store, and restaurants are less than a mile away. Close to I-10, Tempe, Scottsdale, Chandler Mall, IKEA, Casinos, Racing, Baseball Spring Training, Professional Basketball, Football, Racing: all the amenities that Phoenix can offer. Just 15 minutes from Sky Harbor International Airport. Make this your home base for day trips and sightseeing. Conveniently close to Tucson, Mexico, Sedona, Grand Canyon, and Las Vegas. I moved to Phoenix in 1994 and am almost a native at this point! My husband and I are both originally from Kansas and although we have lived many places in the US, we have grown to love the west and southwest. After coming to Ahwatukee for a job, I stayed to retire! This was my home until my husband and I bought another home very nearby because we love Ahwatukee. This home is very special to us and we treat it and our guests with utmost care. I love the openness and lightness of the house, the tile floors, the plantation shutters and wood blinds, and the private garden. The house is in a small retirement community where neighbors know each other and where the HOA Board takes good care of the house exterior and landscaping. There is a neighborhood pool and clubhouse just a short walk away and there are frequent social events. The community is in the heart of Ahwatukee and close to local shopping needs, and to larger malls. It is just off I-10 and 20 minutes from the airport. Full sets of sheets and towels provided. Washing machine and dryer are conviently located in hallway off the bedrooms. Available on drive way and on street. Many houses in Phoenix have a "great room" which takes the place of separate living and dining rooms. New stainless steel refrigerator with ice maker. New Electric ceramic top stove with full size oven and broiler. Fully furnished with service for 8. Full set of dishes, glasses, cookware. Open to living room for ease of serving. Dining area is part of great room which is open to kitchen area. There is a small wet bar connected. It is a very open floor plan that opens through sliding doors to the outdoor patio. New 48 inch flat screen TV mounted on wall in living room. Second 32 inch TV in master bedroom. Private garden with small grass area and desert landscaping. A mile away is the Ahwatukee Country public Golf Course and two other Ahwatukee Golf Courses are less than 5 miles away. Must be 55+ to qualify. Have access to a full access senior center with two pools, exercise room, classes in many topics, and events and trips. Just a short walk away is the community pool. Renters also have free access to the Ahwatukee Senior Recreation Center which has a heated indoor pool and a large outdoor pool. Beautifully decorated, clean and inviting!!!! The new landscaping in the backyard was beautiful!!!! Being from Michigan, I never imagined there was so many beautiful cactus varieties!!!! We truly enjoyed sitting out on the patio on a daily basis and watching the daily visits from the hummingbirds!!!! The house itself was very nicely decorated, well stocked with cleaning supplies etc.!!! Everything was better than expected. Janet was great !!!! I wish we could come back next year but she is already booked!!!! Thank you Janet for a memorable time!!!! Thank you for such a gracious review. We enjoyed hosting you and Frank and your two Yorkies. So happy that you were the first to welcome the new landscaping complete with the hummingbirds! You are a frequent vrbo visitor so we really appreciate the positive feedback. Enjoy the rest of your winter vacation. We had a wonderful stay in this beautiful home. We had everything we needed. The beds were comfortable, kitchen well stocked, and the living room was very comfortable. And Janet and Ed are GREAT. 'neighbor" and I'm sure we will have future contact. The house was what we expected from the pictures we reviewed prior to committing to the rental agreement. It is a 55 plus community and was quiet and safe. The area has an abundance of stores and restaurants. It is close to interstate 10. In the house itself all necessary items are included to cook, wash clothes, etc. The bed was comfortable and they provided internet service. All in all I would give them an A rating. We we look for a rental again, this will be our first choice. Thanks to the owners! Thank you so much for your stellar review. We are so glad you enjoyed your month’s stay in Phoenix. Come see us again. This home is beautifully maintained and so comfortable. This location is very convenient to shopping, movies and restaurants. The neighborhood pool and Ahwatukee Recreation Center are great! We had another great stay at this wonderful home in Ahwatukee. Close to shopping centres, grocery stores and retail outlets. South mountain is handy for hiking and there are several golf courses in the area that we played. The owners are a pleasure to deal with and ensured our stay was comfortable. Access to private Ahwatukee Recreation Center facilities: gym, indoor and outdoor pool and hot tub, exercise and interest classes, dance, theater and other events. Deposit Fee of $500 is due, plus 50% of the booking total is due at time of booking. The remaining 50% is due 30 days before arrival. The home is in a retirement community so one traveler needs to be 55 years of age.